As the end of a10th Birthday year for Ibiza Rocks approaches, plans are well underway for 2016 and for a brand new pool party residency from the platinum album-selling UK Garage and R&B artist, Craig David. 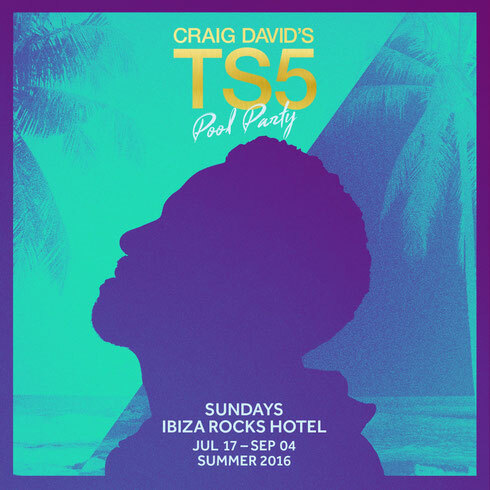 The revival of one of the UK’s finest talents is more than enough reason to celebrate so in keeping with the sun-soaked party vibes created at his home in South Beach Miami, Craig’s TS5 is Balearic bound for a daytime pool party residency at the Ibiza Rocks Hotel every Sunday from 17t July to 4 September (1-8pm). TS5 started out as an exclusive pre-party in Miami hosted by Craig at his penthouse home where he went from playing to 10 friends to hundreds as word spread, the party organically grew and the TS5 brand went international. With Craig’s ability to sing, MC and work the crowd while DJing simultaneously, fans can expect sets combining massive old school anthems from R&B to swing, garage to bashment and sun-soaked house. Having started out as a DJ before launching his solo career, Craig David went on to sell over 13 million albums, secured 13 Top ten hits and achieved multi-platinum status in more than 20 countries. Now 15 years since his debut ‘Born To Do It’, Craig is back thanks to possibly the viral video sensation of the year. His electric appearance on MistaJam’s #60MinutesLive Takeover with Kurupt FM, Big Narstie and Stormzy amassed 3.5 million views in just 24 hours and the desire for Craig has been on overdrive since. From closing down the stage at this year’s Notting Hill Carnival, blowing the roof off Fabric’s 16th Birthday, sending the crowd insane by appearing at Bestival and with Major Lazer at Alexandra Palace to collaborating with the likes of Chase & Status, Diplo, Goldlink, Kaytranada, Bonkaz, Katy B and Shy FX. There’s also been sold out TS5 shows at East London’s Oslo and Shapes and a weekly primetime TS5 show every Friday on Capital Xtra. With praise coming in hard and fast for new track ‘When the Bassline Drops’ with grime MC Big Narstie, it’s clear that the rise again of Craig is much more than just nostalgia.